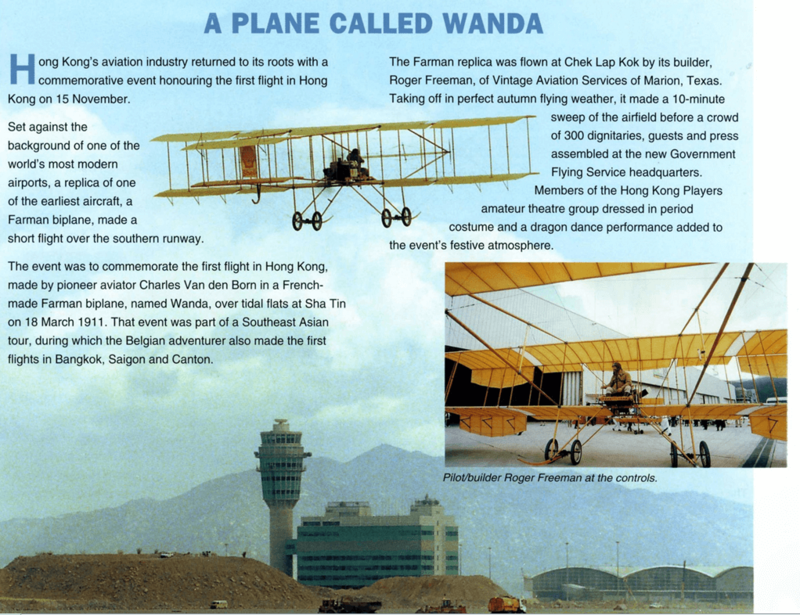 An Aeroplane Called Wanda – historic flight over Shatin March 18th, 1911. For most people entering the main terminal at Hong Kong International Airport from taxis and buses, getting to the Check-In areas is their main priority. They do not see or ignore the vintage bi-plane hanging from the terminal’s ceiling even though it positioned next to well-used pedestrian ramps. Those on the ground floor are more concerned with meeting friends and relatives arriving and rarely look above them. The replica Farman bi-plane depicts part of Hong Kong’s long aviation history and was placed there in 1998 to celebrate that fact. Unfortunately, the plaque describing the aircraft has been hidden by the seating arrangements at the Check-In level since its installation, therefore most users of the airport do not realise it significance. The replica recreated the flight in November 1997. Source: 1998 Airport Authority Press handout. I presume since the airport was completed the AA has been disbanded. HF: according to a current website: The Airport Authority Hong Kong (AA) is a statutory body wholly owned by the Hong Kong SAR Government. Established in 1995, the AA is responsible for the operation and development of Hong Kong International Airport (HKIA). This article was first posted on 25th October 2017.